Welcome in the New Year, 2017, with rest and relaxation in this cozy log cabin with stunning views and 2 levels of wood burning fireplaces to stay warm as you watch the snow fall. Open floor concept with logs and a country rustic feel with plenty of space for your family and friends to enjoy. The chef can still be apart of the entertainment as he/she keeps busy preparing a great meal for all to enjoy! This property is located off Lone Mountain Trail and is less than 1 mile from Meadow Village town center areas. Meadow Village is centrally located in the heart of Big Sky and provides easy access to dozens of activities. OUTDOOR ENTHUSIAST: This luxurious and beautifully decorated home is the PERFECT location for your Yellowstone Park and mountain adventures. WINTER activities: This home is less than 7 minutes away to some of the biggest and best skiing in America. Over 5800 acres of ski terrain between Big Sky Resort and Moonlight Basin: 24 lifts and 220+ trails. You will enjoy the lack of lift lines (in comparison to other ski areas) and the amazing terrain. Snowmobiling in West Yellowstone and the wildlife adventure is 45 minutes away. SUMMER activities: This home is walking distance to hiking and biking trails and less than a minute away from the Big Sky Towne Center where farmers markets are held and weekly FREE concerts in the park! 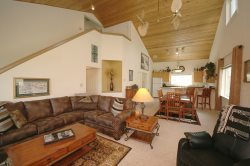 Nearby to famous Gallatin River fly fishing, white water rafting, horseback riding, and golf. The chef in the family will appreciate the fully equipped spacious kitchen with appliances, range with oven, custom cabinets, entertaining bar to enjoy the company of family and friends in this beautiful open space and vaulted ceilings throughout. The living room with adjacent sitting areas are all part of a grand gathering area, that can be expanded outdoors to the deck, enjoying time together with family and friends, treasured memories in the making in this open floor plan with cathedral ceilings, chess and game areas, wood burning fireplaces, flat screen tv, wifi, and expansive views. Whether visiting in the summer for Yellowstone National Park or the winter to ski, this home is exactly what you dream about when you picture the perfect home with stunning views! For the convenience of your party we recommend having a vehicle on hand for the short drive to the base of Big Sky Resort lifts. Deluxe and beautifully appointed with two master suites and plenty of twin beds for kids or adult guests. Satellite TV and wireless internet throughout. • Bedroom #1: Master Suite #1, main level: king bed, en suite bathroom with walk in closet and private door to outside deck. • Just under 3000 sq. Ft.